We help professionals acquire new clients. Culture change is the most effective mechanism for producing superior results. With a strong business development culture, everyone in your firm will be more inclined to participate and excel. Since 1983, we’ve been consulting with the management of professional service firms to improve business development. Welcome to BizDevCoach® It’s a dashboard on your computer to help you plan and implement your biz dev strategies. It keeps your biz dev front and center. It provides the structure you need to maximize your success. Register now for your free 30-day trial with no obligation. If you want to improve your business development, you’ll need to remove old habits and replace them with new ones. That process can be very difficult since old habits are often deeply entrenched. Coaching is a process of getting guidance through a series of on-going phone calls. During each call, you get practical tips. Your coach will give you proven strategies. Then, you’ll let your coach know the tasks you plan to implement prior to the next conversation. The process is educational and motivational. Call us to learn more about how coaching works at 310 717 0998. We look forward to discussing it with you. We offer a 6-week business development course for professionals entitled: Biz Dev Essentials. The course is a comprehensive program providing proven strategies for overcoming obstacles, creating a practical plan, and following through. The course is a combination of 6 live lectures via a telephone conference call and the full use of our unique web application BizDevCoach® during the series. Each lecture is approximately 30-minutes. The meetings are scheduled for 6 consecutive weeks. The next course start date: To be determined. An ever-increasing number of law firms now utilize client satisfaction surveys as a necessary and proactive client relations and business development tool. The benefits are profound. Well-designed and properly executed satisfaction surveys not only enhance client retention through improved service, but also set the stage for expanding relationships and increasing referrals. We have been helping lawyers and other professionals in business development and client relations since 1983. We know how to overcome the obstacles to doing surveys, how to choose the right clients to interview, and how to elicit candid feedback beyond numbered scores or ratings. We also provide crucial follow-up strategies that servicing partners can use to turn positive feedback into more business. 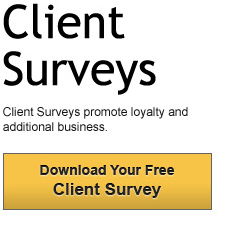 If you would like to discuss our offer of a complimentary survey design and our conducting one free client satisfaction survey for your firm, let me know. The best way for you to experience the benefits of surveys – and our unique approach – is to give it a try. There is no obligation. For more information about our survey approach and how we can help you implement a client feedback initiative, please call 310 717 0998. We look forward to discussing it with you. The coaching is conducted via telephone – usually in 30 minute sessions. During the coaching sessions, we help board members identify their obstacles and then, we provide practical solutions. We’ve been coaching board members in non-profits since 1983. We have helped hundreds make significant improvements. Please contact us for more information.